It’s been a hot minute since WSOTP has hosted an actual live event. We’ve not yet held a watch party this Premier League season, and our last live podcast recording was way back before the Women’s World Cup final. Hell, we’ve barely even had a chance to watch a match outside of the friendly confines of WSOTP World HQ — you can blame our offspring for that. 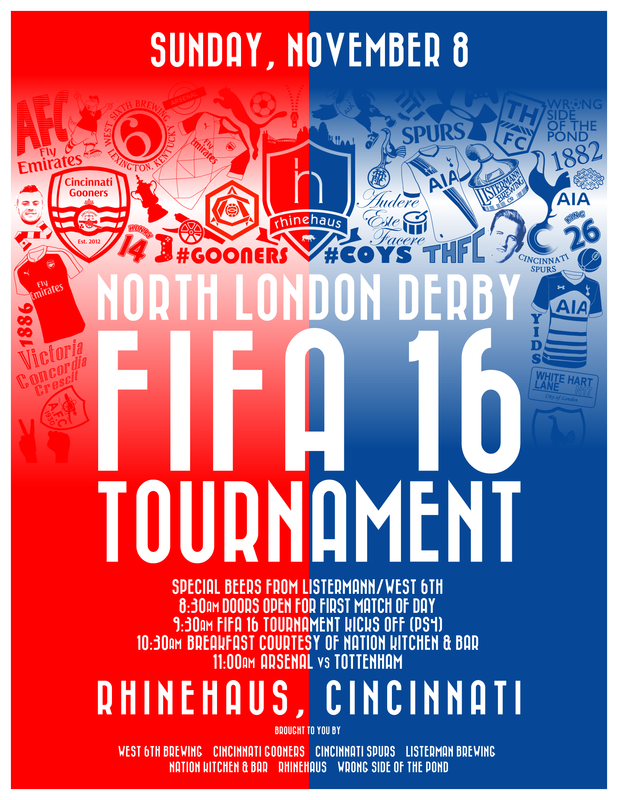 Alongside our friends from the Cincy Gooners and Cincinnati Spurs — not to mention sponsors Rhinehaus, Nation Kitchen & Bar, Listermann Brewing and West 6th Brewing — we’ll be hosting a FIFA 16 Tournament before the approaching North London Derby between Arsenal and Tottenham on Sunday, November 8th! Want some details on the event? Of course you do! UPDATE 10/23/2015 @ 4:00pm — There’s been a slight change to the schedule on Sunday and the poster above and the information below has been updated to reflect that change. Things will kick off at 8:30am Sunday morning when the doors open for the first match of the day on Sunday. Around 9:30am we’ll get started with a free-to-enter, PlayStation 4-based, single-elimination tournament in EA Sports FIFA 16. And yes, prizes will be awarded to the winners of both the tournament and the derby, like this dope trophy. Roughly 10:30am or so, Nation Bar & Grill — the sister restaurant to our hosts Rhinehaus — will be offering up free breakfast. Listermann and West 6th are also whipping up special beers for the occasion. Then, there’s the big game itself, which kicks off at 11am. UPDATE 10/28/2015 @ 10:30am — We now have a registration form for the FIFA Tournament for those who wish to participate: click here to complete the form. And worry not if you’re drawn against me: my most recent console is a PS2 and the last time I purchased the game was for FIFA 12. Again, you can thank the kids for that. Anyway, be sure to come out to Over-the-Rhine and stop by Rhinehaus on the morning of Sunday, November 8th, for some food, brews, and banter, and if you’re lucky, the claiming of some bragging rights. Plus, you can do all of that while enjoying some football in the company of Wrong Side of the Pond. Next Post: WSOTP pod: fifteen goals for D.J.